If each of Forced Entertainment’s pieces were a room in a house, Pleasure would definitely be the basement — a dark, scary place of surreal melancholy. With a soundtrack of old tunes played at 16 rpm, Pleasure takes you down the stairs to a strange nightclub at some drunken, half-magical 4am. Framed by the weary comical text from a cynical MC, Pleasure is about love, hope, modern life, the gods descending to Earth and TV dinners. There are hopeless Hawaiian dances, a horny pantomime horse, failed William Tell routines and a catalogue of obscene words and phrases scrawled on a blackboard at the back of the stage. 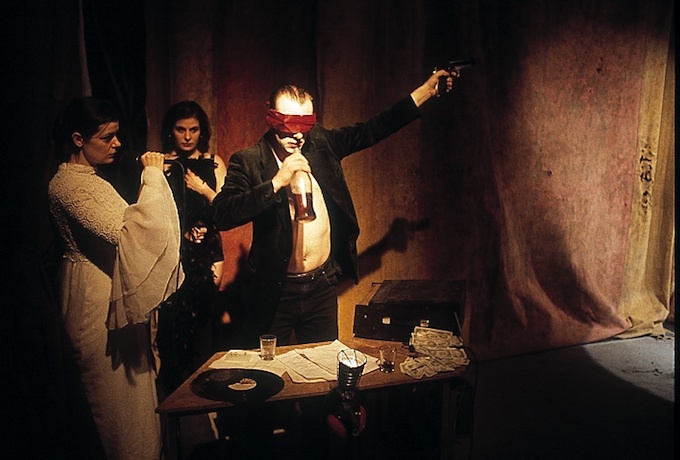 This latter part of the performance later became a video work of its own, called Filthy Words & Phrases (1998). 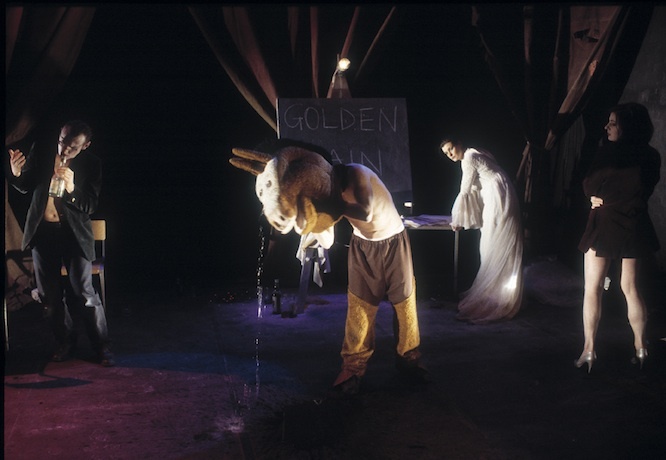 Pleasure was the subject of a South Bank Show documentary film On Pleasure (1997), directed by Alexander Kelly and made in collaboration with the company. Pleasure is a Forced Entertainment production. #FE84 – 14, No. 6. #FE84 – 14, No. 10.